This is the third of my road trip posts and you can see San Francisco to Mendocino here and Mendocino to Eureka here. For this day I drove from Eureka to Crescent City with a detour up to the Oregon stateline and back. 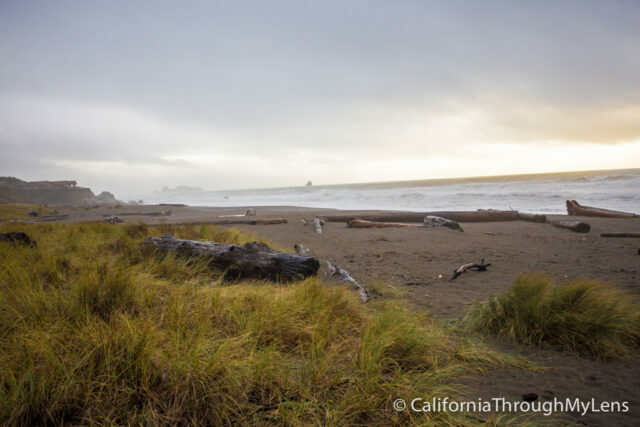 You can easily use this post for a trip all the way to Brookings, Oregon or on to the coast of Oregon but for me I headed back to Crescent City. Here are my recommended stops. 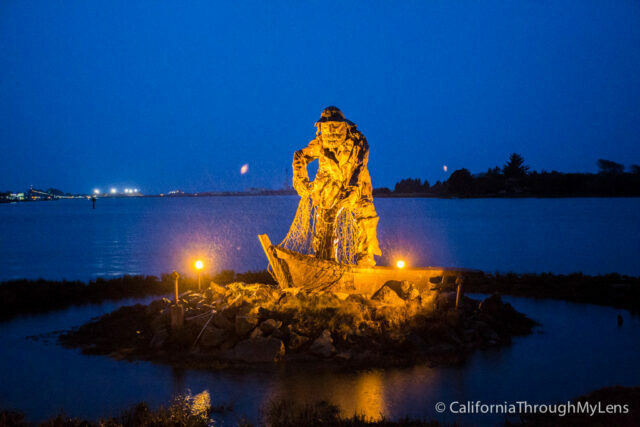 Before leaving Eureka I stopped at the famous fisherman statue on Wooley Island which you can find by Googling “Woodley’s Bar” then driving to the end of the island (thanks to a reader for commenting this below). The statue is dedicated to those who live off the sea and those the sea has taken, this is a beautiful statue that deserves a visit. 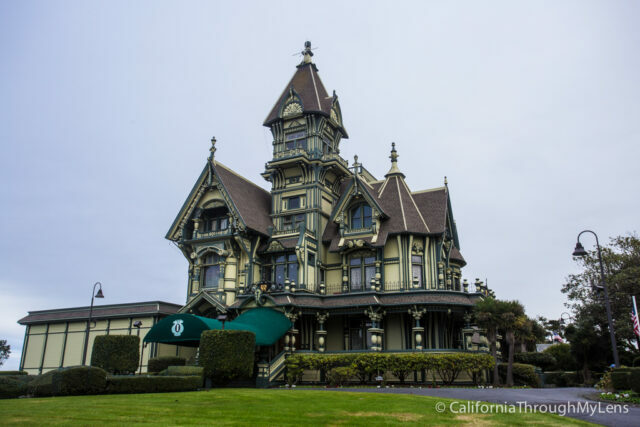 One of the most picturesque and famous houses in Northern California, Carson House, is said to have inspired Disney and Alfred Hitchcock. It is privately owned, so you cannot tour it, but you can take a picture from the outside. One of the things I love about driving North is the small coffee shops that start to pop up. Dutch Brothers is one of my favorites as they have a lot of crazy drinks. It is an easy stop and one that I recommend for coffee fans before leaving Eureka. 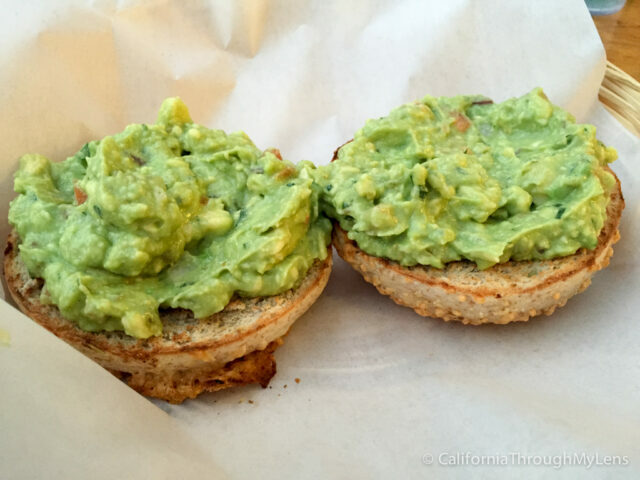 Either in Eureka or Arcata, there is a Los Bagels which is my recommendation for breakfast. This is a great, relatively cheap restaurant that has a ton of options for everyone in the family. I got a guacamole bagel, and the wife got a blackberry and cream cheese bagel. It has a fun vibe and great food; we went twice. 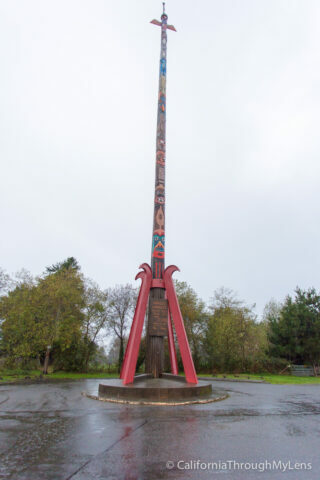 Like the name says, this is the Guineas Book of World Records world’s largest totem pole. I was not ready for how big it was, at 160 feet this thing is gigantic. It is randomly behind an auto parts store in a small shopping center, but it is worth a picture. You can find it by driving behind the Safeway in McKinneyville. The town of Trinidad is a great little coastal fishing village with a unique history. 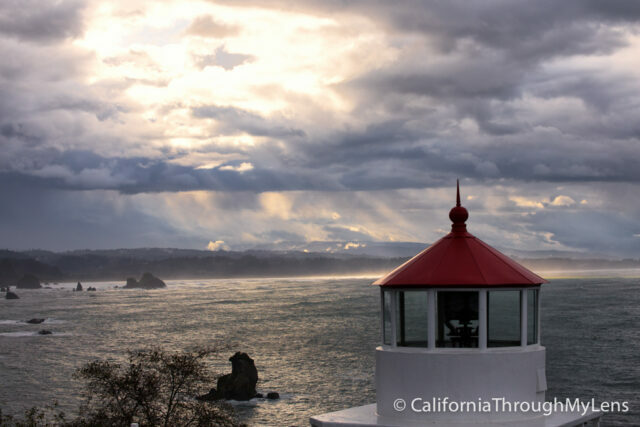 I recommend stopping at the Trinidad Lighthouse that has been moved to a great location overlooking the coastline below. It is a fantastic place to sit and each your bagels or just soak in the view for a few minutes. 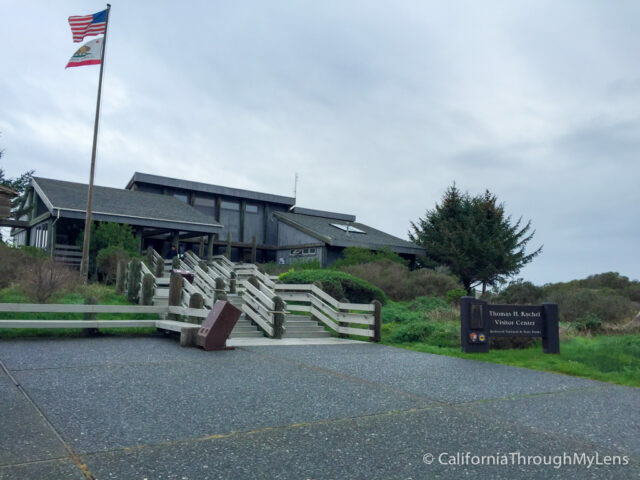 As the best non-redwoods park in this area, Patrick Point State Park is a fun place for a stop. You will need to pay $8 to get in, but when you are in you can tour an old Native American town and climb to the top of Wedding Rock. You can also walk down to the picturesque beach which features massive rocks that the waves crash on for your enjoyment. After driving up the highway for a little while you will see the signs for the visitor center of the Redwoods National Park. I recommend stopping by and picking up a map so you know what trails you would like to visit in the park. 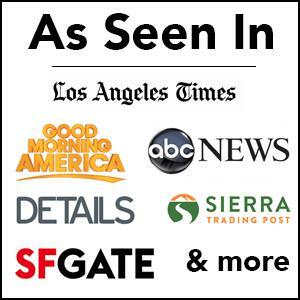 The docents are super helpful so they will be able to direct you to wherever you would like to go and there is a lot of great info here on the Redwoods themselves. 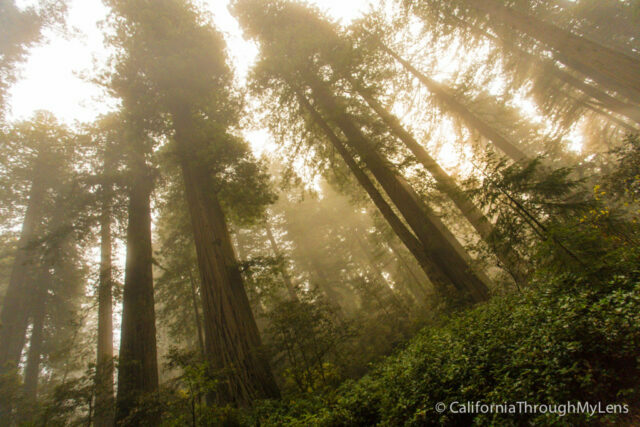 If you only have time for one walk in Redwoods National Park make it Lady Bird Johnson’s Grove. 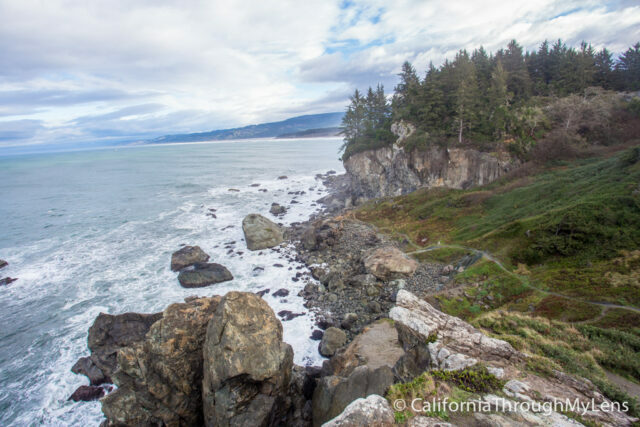 Named after the First Lady who loved this area, this grove features a beautiful collection of towering coastal redwoods all within a 1.5 mile walk through the forest. It feels like something out of Jurassic Park and you should love it. 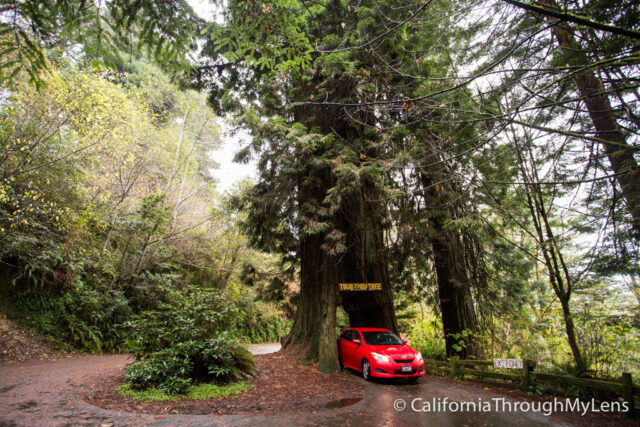 About 10 minutes down the road from the grove is another drive-thru tree. I figured I might as well drive thru every one I came upon so I drove thru this one as well and paid my $5. This one is literally just a tree to drive thru and there is not much else here. There are emus across the street though! I would be lying if I said you could do all of the stuff on this post and Fern Canyon in the same day, that would be tough. 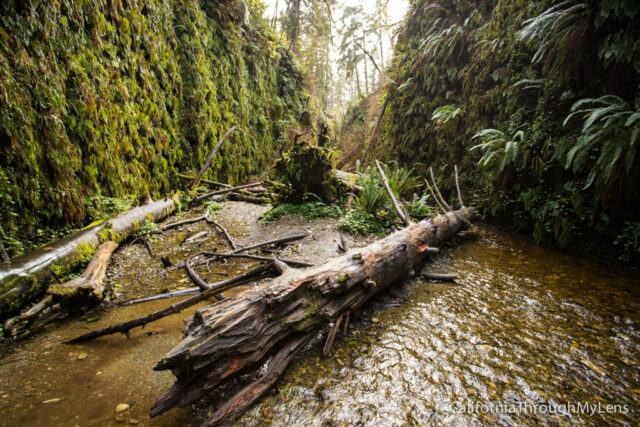 I did Fern Canyon on the way back though, and it was one of the best places I have ever visited in California. Read the full post on it here. 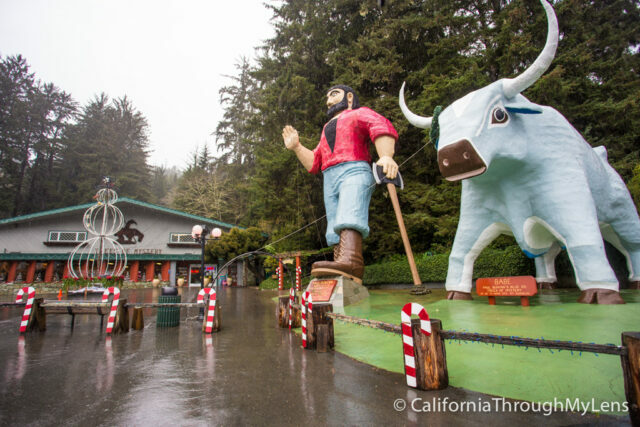 Even if you don’t visit the Trees of Mystery themselves you must stop to see the 60 foot Paul Bunyan and his trusty 30 foot Ox Babe. It is such a fun picture. If you want to explore the Tree of Mystery as well it will be $15 but I highly recommend it as it has a lot of unique trees, a gondola ride and a lookout platform. It will take about an hour to do everything. For lunch I recommend Hensels in Crescent City. 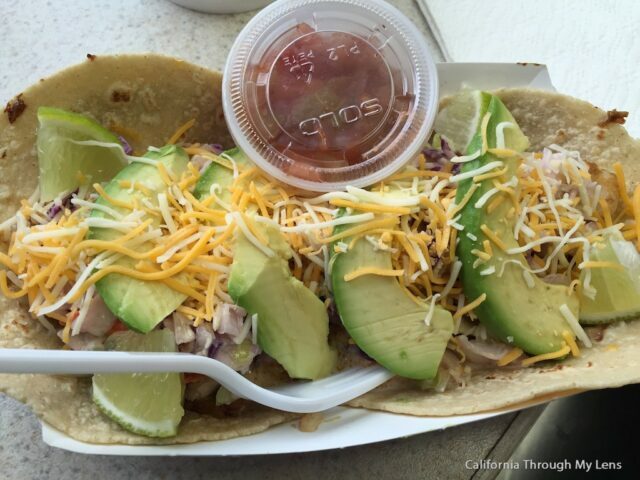 This small little shop has some of the best fish tacos I have ever eaten and the owner catches the fish himself that he cooks. Don’t let the appearance fool you it is exceptional food. Since Hensel’s is now closed a reader suggested Vita Cucina as a good backup option for sandwiches and baked goods. Let me know if you have other suggestions in the comments. In the West end of town there is a little island where a lighthouse sits on it. Apparently the road that leads to it washes out in high tide (it is never driveable but you can walk to it) so I was not able to go. I sat on the beach for sunset though and it was still one of the most amazing pictures I have taken, especially with the high tide turning the lighthouse area into an island. I highly recommend a visit to it. 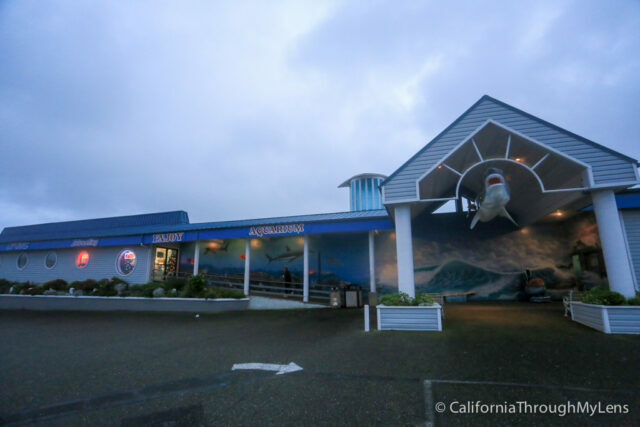 I didn’t go myself, but I know a lot of people that love this small aquarium in Crescent City. If you like these types of things then you may want to go as well. 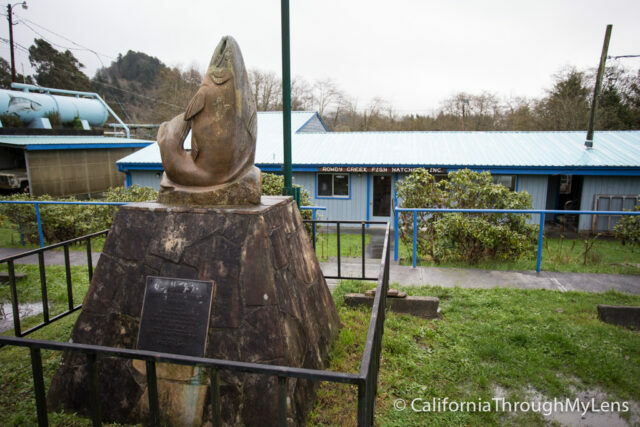 Fifteen minutes outside of Crescent City on the Smith River is a fish hatchery for Steelhead. You can call to schedule a tour, but if you just drop by when they are open then you can walk around at your leisure and look at what the non-profit is doing. It was a lot of fun to see the growth process of the fish of the fish up close and to walk around the river right outside the hatcheries backyard. 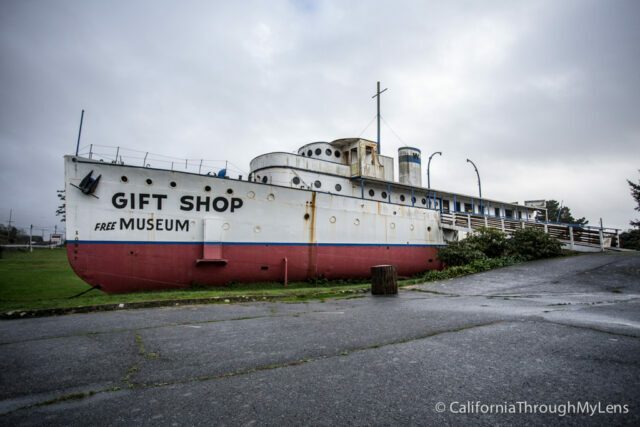 This was also closed when I went, but there is a massive ship that sits on the land right before the Oregon State Line and has a gift shop and museum you can explore. I took pictures from the outside and would love to hear if anyone has been in it. As the Northernmost State Beach in California, Pelican State Beach is pretty worn down, but it still is a beautiful place to explore. The road leading to it has a ton of potholes and when I was there no one else was. It was a beautiful beach though with driftwood all along the sand and views of both the California and Oregon coastlines. 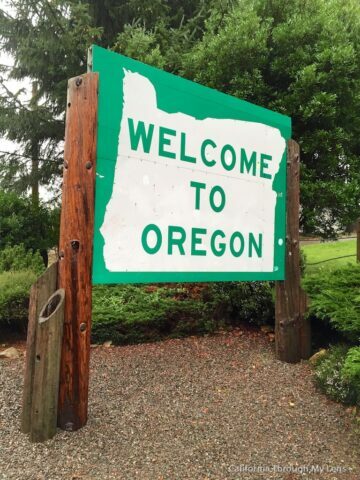 As the last stop on this trip, it was a little bittersweet to see the Oregon State Line sign. I took pictures here and celebrated the last three days of driving and all of the amazing adventures we had. You can continue to the town of Brookings or go back to Crescent City like I did. 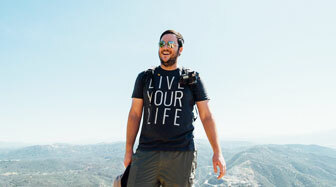 If you want to continue the drive all the way up to Seattle, check out this post. 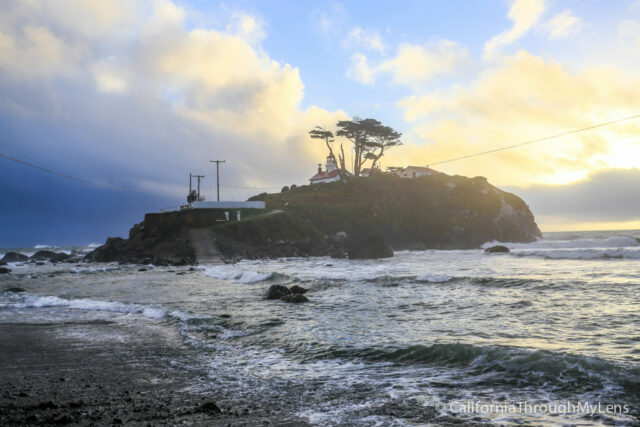 All in all, it was an amazing way to see the California coast and I recommend the trip to everyone, feel free to let me know what I left off in the comments.